Por fin ha salido Runner's World, ha tardado mucho, supongo que para meter lo relativo a la Maratón de Madrid. Han respectado el texto íntegro, excepto la línea final de agradecimientos, lo que no me ha sentado especialmente bien porque en este tipo de líneas es el que luego me tendría que basar para conseguir alguna financiación futura (que no ha sido el caso este año). 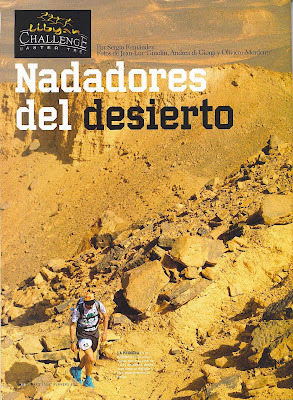 Esta es la ausente: "Gracias a los colaboradores Buff, Colegio de Gestores Administrativos de Madrid, Ranning e Injinji"
10th October 2002; I received a call that disturb me: the race I was preparing with passion during months was cancelled; was going to take place in south of Libya, I win it in a series in Spain and final prize was disappointing because of circumstances. In that moment I remember, not to hopeless even more, that I thought in the illusion of the way that took me there, the tough and nice trainings, being focus during months; I never fully assimilate it, a thorn remained nailed in me, and every time I read o watch something about Libya, Gaddafhi or whatever, something turn around myself, very inside. 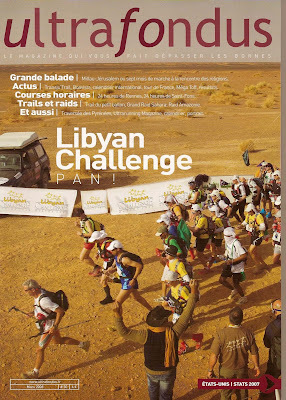 One day, three years ago, I discovered Libyan Challenge, sooo many kilometres, in the same place, with a new organisation, and started to raise what could be my main sport challenge. 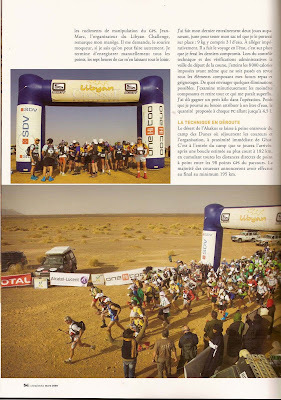 That’s why I run in Mongolia in 2005 (100km); that’s why I run in Boavista, Cape Verde, in 2006 (150km); and that’s why I also rested on 2007 to save money, euro to euro, and be sure to be there, was my desire. I wait patiently six years: thorns exists to be removed one day. Sâhara was not always the sterile and extreme life conditions we know today; it was an orchard not so long time ago, until a fine Earth’s axis movement (called precession) change meteorology and capacity of terrain to retain water, devastating most of the life and moving humans from there; proofs of that close past can be seen in valuable ancient paintings that shows us how was life in actual biggest sand desert; many of them can be seen in Tadrart Akakus, a solemn bulk who seems to emerge from dunes. As amazing and rich in paintings and petroglyphs that UNESCO declared it World Heritage in 1985, in the same session that were also declared our decorated caves from Altamira. If climate was close to kill life, on the other hand we have the ideal place to explore ourselves, the perfect scenario to push our limits for about 200km in a non-stop way, carrying with everything we needed and with the only help of a GPS not to get lost in that stony and sandy labyrinth. We never know –and will never know- how to explain why we are so attracted by those places and why we want to cross in the purest and hardest way; but motivates for months, months to practice and save money, until both set ourselves in a lost place of the map, full of doubts, but with certain that attaining the goal or not, we will have more painful knees and bit wiser. Flying over Corsica coming back home, I reaffirm myself that the courage is in taking part not making it. Watching though internet, reading in a mag o if someone tells it to you, can be exciting; but now I am, I, an average runner, sitting on a stone waiting to start who must think over and reframe All This. Two hundred kilometres is All This. For months I try to forget the distance from mind, because hand’s sweat expose me that I wasn’t sure of what I was going to do, and I cannot lie myself; just underneath fear was me. …Trois, deux, un. Arrived that second in which you’ll how much valid you are; if you trained enough; if you overate or infravalued yourself. All in a row, mixed with high temperatures, doubts in orienteering and enormous respect. For the first time in years I leave leaders to break away without taking care of my position, I will not estimate my ranking, my goal is finishing, bend my head and follow my own path. I focus in empty regrets because of the weight of my backpack, caused by old fashioned material and some excess of food, some «psychological»: my experience tells me that you have to balance powerbars and gels with chorizo (pork sausage), but my back complains, my shoulders complains, and my slow pace too. The only way to light it is eating as much as possible, and that’s the only reason I wear a watch, to eat periodically, with seconds precision; this time I promised myself not to kill myself because of hungriness. Approaching third check point (km72), the one I’ll arrive during sunset, one sand tongue attracts me like a magnet; path is half-free while CPs are mandatory, and it allows some creativity. One of them is in front of me, I have the confidence not to find a cliff behind, go up with faith and down for a steep sand tongue as a little prize for my resign to follow everyone path. I never stop exploring. I don’t repeat this originalities cause I have to be careful, but I left there my footprint and a big smile. Anyone who have experienced long distance runs knows that nights are when races are lost; I begin my night bit worried because I saw an Italian girl losing consciousness repeatedly and cause I disoriented for a while, and supposed a semi-climbing section was not planned. It’s fun checking that you always believe who’s in front of you is following the right path, and as I rounded a little mountain before following I didn’t have to, two runners followed my light causing them some problems; I think they were thinking on me and some from my family… During night, GPS is essential, but only with it you’ll not manage very far: you need intuition, pay attention and some logic thoughts, for not making kilometres in excess and not get desperate and waste energies on insults. And maybe nor GPS or logic will take you far if you are in an erg (sand sea) with your tiny light, be sure you’ll run up for steepest possible way using your hands, and down for the steepest too, with sand until your knees; it will require an effort only rewarded with some of the most amazing natural formations you can see, those captivating dunes you’ve dreaming with since you’ve seen the Dakar when you were a child. 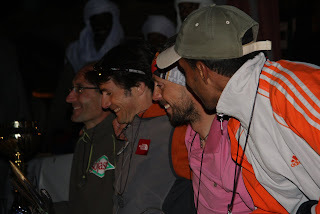 Far away I can see some reflectives; later someone on the ground; finally, Benoit Laval –one of the best French ultrarunners, indeed, one of the best of the world- that had to stop, in a mix of exhaustion, being sleepy and low motivation. Later I heard that winner, Sebastian Chaigneau, also had to stop an hour for cramps. It’s party time! Mp3 sound loud on my ears, I eat a marvellous paella (liofilized, of course) in check point four, I killed my quads, but I get some motivation because I know I’m half way, in distance not in sufferings. Minutes later I found out I can fight for podium; someone can think can motivates you, but with 100km in front was too soon to think in rankings, and I didn’t wanted to start with guerrillas fighting soon. My travel companion, Ismail (Libyan) and Sharon (English), didn’t have the same opinion, and seconds later they initiate hostilities, each of us with energies we thought we had. And of course, I had a chest number, proud, and I trained a lot to be here, I had to try it. We do some tricks continuously, we push each other trying to exhausted them, but we don’t give up, and if so we close the gap with big suffers. We cross regs (stony plains), ergs, up and down, restless, we didn’t have a second to rest, and we have no reason to think it was going to be later. The changing and always difficult terrain maybe was even tougher than distance: I never expected, because if I’d knew it probably I’d never had the anger to come. Human treatment and attentions in every check point invite to take some minutes more; it’s unjust and incomplete CP or check point: they are oasis, not only for water and shadow, you make the peace with yourself, take time to recompose and find the strength to face following hours. Luckily I had tough and motivated rivals, didn’t allowed me to relax, push me to keep focus, specially Sharon Gayter, from who I learnt a lot, and with the one was a big pleasure run with. Arriving CP7 supposed a steep downhill, one of those in which a trip can send you with Allah, 300m underneath; and obviously I had a trip, but only a nail was killed. Surprisingly, Ismail had to stop for cramps, but Didier (we had our names written on our chest numbers) came to substitute him and made more difficult the podium again. Second, third and fourth. One exceed. Forces were very short; first Sharon had problems and I felt great and strong (on km150? Is that possible? I didn’t know it...); later I killed myself (as supposed…); and finally Didier arrive that section and had to lie down, in fetus position, killed by excesses, in front of me. 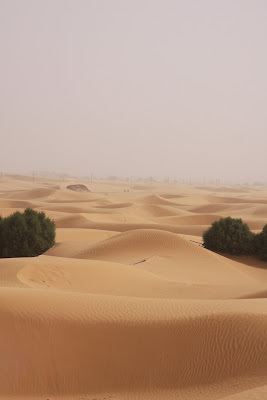 To finish there was only sand, one dune and another, the beginning of the second night, and, of course, angriness growing for the slow approach to Arrivée arc. Only in the last CP a girl told me keep smiling and it distracted me for a while, cause I wasn’t enjoying from some time ago, I desperate, I insult the cruel organiser, exhausted without motivation, until a tiny light behind me wake me up from my stupidity, and last four kilometres to finish line I had to fight with more belief than energies to defend a position I deserve was mine after 36 hours of non-stop effort; even I consider second was mine based in a diffuse law I invented in that moment, but I made mine in a clumsy and intense ford of final dunes. And there is, the thin line, invisible to untrained eyes, the one who divides dreams and reality; because although you can feel satisfied or even happy to arrive, your dream has an expiry date, and you’ll feel empty in moments, and will leave you absent some days. That line, I hate the same I love. Many pains, difficult dreams, slow recovery. Quick goodbye not to show what I was feeling. Thanks a lot who make All This possible, Jean Marc Tommasini and his staff, wonderful craziness. A dream less, much more memories. Thanks to Buff, Ranning and Injinji.